Draft Profile narrated by MDS. So they got a guy that is a good pass rusher but not so good against the run and weak at the point of attack. He can spell Babin, maybe on passing downs. Cool. I would have preferred a CB but don't really hate this pick. He can line up at both end spots which is convenient. So DRC, Curry + for Kolb. Seems fair. So they got a guy that is a good pass rusher but not so good against the run and weak at the point of attack. He can spell Babin. Cool. Isn't Hayward still in play? I'd take him over Boykin but either would be fine. 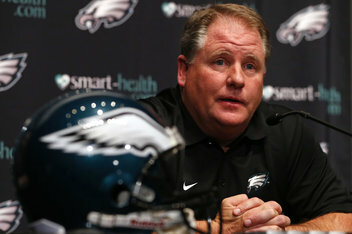 I kinda hope the Eagles trade up just so I can stop listening. These guys are killing me. Oh, there we go. ESPN has an audio only feed on their website. That much is obvious, but you still need DEs that can stop the run since they are responsible for the edge, not the LBs, which is one reason why Cole is overall probably a top 3 4-3 DE. I don't hate the pick but I would have rather seen 2 or 3 other needs addressed first, and if they go DE get a guy who can play the run to spell Babin or Cole on run downs. Especially now with Cox, they have enough fastballz.